Does anyone have a fix for this. I'd prefer a fix instead of a workaround. There are various reasons causing this issue, like photo size, CPU, disk speed. I have SSD on my PC with latest Windows 10, the photo opens speed as I expected. You can first try to clear Photos catch to see if your issue can be fixed:　Also, we can use process monitor to capture the system events when reproduce this issue, Use Windows performance monitor to capture the disk IO, CPU usage, time trend also and see what's the root cause. Step 1: Open Settings. Navigate to Apps > Apps & features. If you cannot see the Apps category in Settings (happens if you are running Anniversary or earlier builds), please navigate to System > Apps & features. Step 2: Look for the Photos app entry. Click on the Photos app to see Advanced options link. Click the link to open Storage usage and app reset page. Step 3: Click the Reset button. Finally, click the Reset button when you see the confirmation dialog to Reset the Photos app. Try opening a picture file with the Photos app now. It should open instantly. Resetting did not work. My old windows phone opens pictures better than this. The Windows 10 photo viewer seems to be quite advanced and is not your run-of-the-mill image viewer. Mine was slow too, which led me to do some minor research. 1) The app "phones-home" to Microsoft with some sort of usage data. This uses your network connection. If you have a slow network, or other reasons why networking slow, this could be your problem. 2) The app maintains a database (SQLite) of images. The database contains information on all your images. So if you open up the app in a folder with a lot of other images, you will see a slowdown because it's doing a lot of querying (probably to speed up slideshow). This is all I found so far. These factors explain enough of why the old image viewer would be quicker. Is there any update on this issue? If so, please post back here. This is not an excuse for such behavior thou. Multi-threading is not a new invention and photo viewer could view image in one thread and call home with database update in another. Users are slow, they want to open picture asap and look at it for a long time. There is no real reason why it can't do it's stuff after the picture is viewed (when user would most likely stare at it for some time) rather then before. Honestly, I agree with MichDem. Why it can't just quickly open and let me see the photo faster? GONE are the good days. Instead of getting better and fast. Even biggest companies like Microsoft is fooling customers. XP was best. All you know. Now windows 10 worst slow. Not just for photos, even in windows explorer, while searching computer or anything. So those are golden days in 20th Century and starting 21st century. Now you can find all worst things in this world. So even Microsoft fooling us. Even after having latest operating system. All updates. Clearing all files. And if check most of the branded windows 10 systems not even supporting ps2 keyboards. I have the same problem. It takes up to 10 seconds to open any picture. Once open it takes up to 6 seconds to open other images. Just hitting the arrows is fast though. I've tried a few free photo viewers but they open minimized or don't auto rotate or my malware blocker kicks off. What is a simple, light weight photo viewer? You'd think Microsoft would have this nailed by now. Very helpful! Thank you so much, I've been dealing with this problem since December. the new update (probably) removed it off the list. what now? i will suggest you please use IrfanView software it is easy fast image viewer. Here is how you can solve the problem . 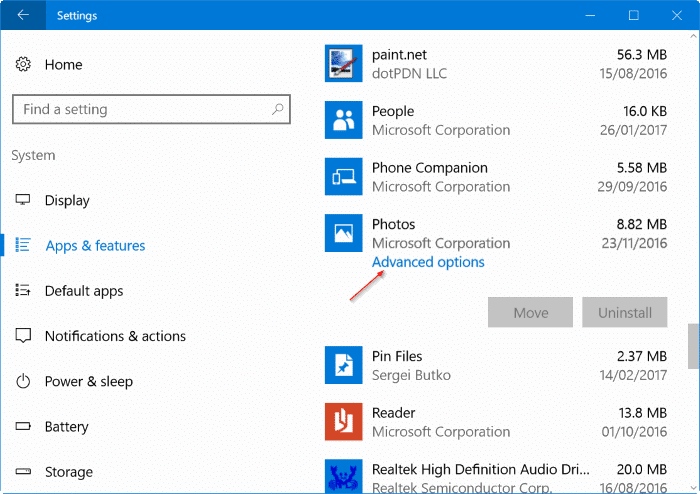 go to photos app , open setting and disable OneDrive Sync . I solved this by ditching the app and selecting the old Windows Photo Viewer for the default apps. The fast, good old photo viewer is still in the 2018 Win10 I've got and now can open pictures in milliseconds instead of many seconds. that's it. works like a magic. so easy to open your Photo. "GONE are the good days. XP was best. All you know." I've tried reseting my photo viewer but it only worked for a few hours. Once the cash (I guess) was full, it got slower and slower. Worked for me. Simple screenshot, PNG format, took 30 seconds (!) to be displayed. After resetting, whatever that did, it's about a second or almost instantaneous. Now, how can I reset Windows as a whole? Clearing the cache worked for me as well. There is a built-in function to do a fresh install of Win. Dig around - it is there somewhere. Haven't tried it though. This worked great for my wife. I did it on mine and it just deleted the photos app. As this issue has been happening for so long, why can't they just provide an update to fix it? Lazy profiteering as usual. That totally worked. Thank you! What I noticed is that, at the bottom of that page, there seems to be an addon that was added without my knowledge to the Photos app. I saw the addon just as it disappeared, such that I could not catch its name. By resetting the app, which is to automatically delete, re-download, and re-install, that addon disappeared, and loading photos went back to the old quick speed. By the way, the app was since renamed to "Microsoft Photos". Therefore, it's location in the list of apps has moved up to the "M" part. I noticed those things too. In other words, MS found the problem and fixed it, but is acting like it's just a fluke that you need to clear. Typical. Thanks for your help, that helps me with my pics. This worked perfectly for me thank you. Originally taking up to a minute to open, now opens instantly. Thank you! this is your solution people for years and years of slow photo viewing, please give this man or woman a beer. Thanks, I just downloaded, installed and used it, really it is faster, open image instantly. 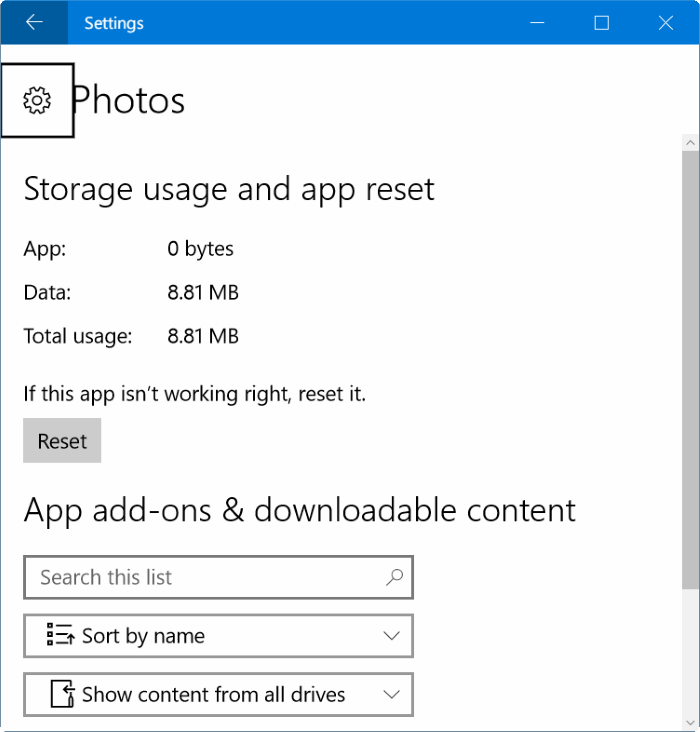 Uninstall Photos App and use default Windows photo viewer. To bring it back download this file https://www16.zippyshare.com/v/AgJ0UfH4/file.html and import it to registry. Thank you, this speeded it up. But if it continues I'll reset. It's irritating that even a 5kb picture takes time to be shown. The photos app loads fast, but the image takes time to show no matter what its size is. Been wondering how to bring old good windows photo viewer back. Better than this slow bloatwared crap. Had the same issue, did as above (Kate Li's suggestion, thanks) but with a slight variation, there's a Repair button above the reset button. It solved my issue for now. P.S. Tried to attach a screenshot but it wouldn't let me. Don't just select Reset, Select Repair... Reset did nothing for me until I selected Repair.